Skills required: long-tail cast on, knitting, purling, increasing, decreasing, knitting in the round, picking up stitches, working a welt (explanations and link to an online tutorial provided,) working an I-cord edging, working an attached I-cord and an I-cord button loop closure (explanations provided). 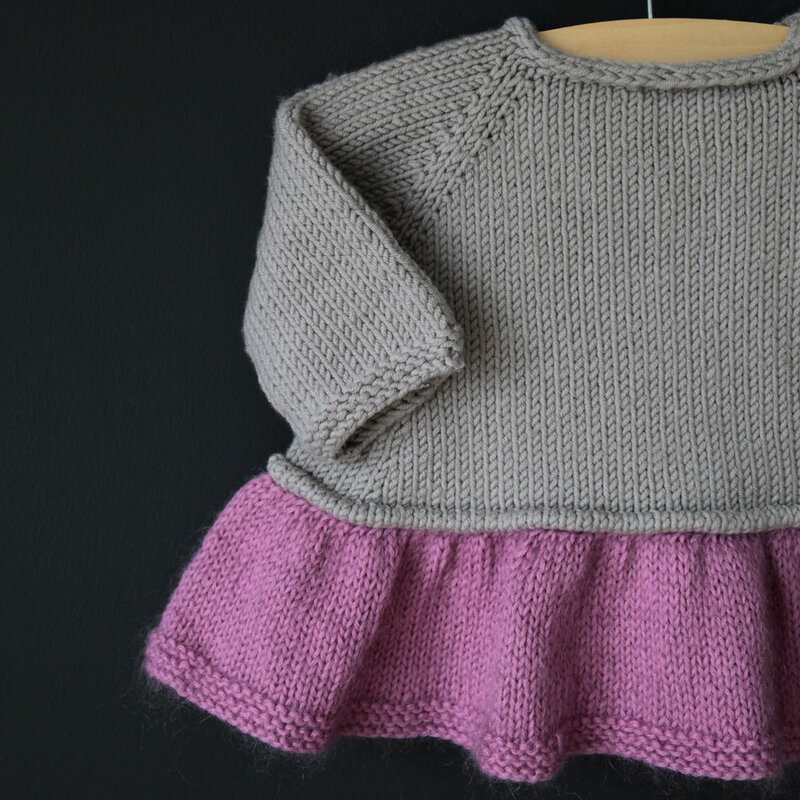 Construction: This top is knit seamlessly from the top down. First it is worked flat with an I-cord edging, then it is worked in the round. Stitches are picked up around the body to create a welt, then the ruffled skirt is worked in the round to the hem. The sleeves are worked in the round. An attached I-cord and an I-cord button loop are worked on the neck portion. Sweet and simple and super-swingy… The idea was to give that gauzy, “tutu” feel while keeping this top modern and practical. The result is not too frilly but definitely girly! To fit chest: 16 (17, 18, 19 // 21, 23, 25, 26.5) inches or 40.5 (43, 46, 48 // 53.5, 58.5, 63.5, 67.5) cm. Finished garment chest: 17.5 (18.5, 19.25, 21 // 23, 25, 26.75, 28.75) inches or 44 (46.5, 49. 53.5 // 58.5, 63.5, 68, 73) cm. Note: In general it’s best to go by the child’s actual chest measurements when selecting the appropriate size. Contrasting Color (CC): approximately 75 (100, 125, 150 // 175, 200, 225, 250) yds or 69 (91, 114, 137 // 160, 183, 206, 229) yds meters of aran weight mohair blend yarn. US 9 or 5.5mm 16-inch or 40cm circular needle for five smallest sizes, 24-inches or 60cm circular needle for three larger sizes. (or size needed to match stockinette stitch gauge). 1 set of matching dpns for sleeves. US 7 or 4.5mm or US 6 or 4mm 24-inch or 60cm circular needle to work the welt. US 7 or 4.5mm dpns for I-cord and sleeve hems.